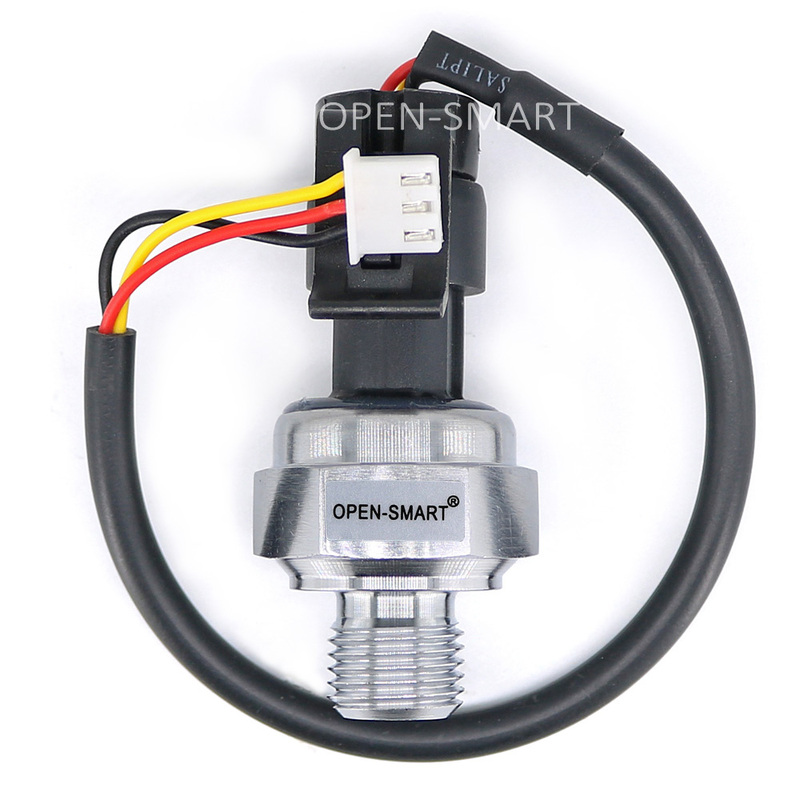 Does anyone have experience with water pressure sensors (1-2 bar / 0-10m water pressure)? The sensor needs to be submerged (or perhaps behind a membrane). The Bosch air pressure sensors only handle "normal" air pressures (1.1 bar max). @mfalkvidd wouldn't you want flow rate and not pressure? I am assuming this is to calculate water usage, which sewer usage is typically based off your water usage. Maybe my assumption is wrong. @dbemowsk in this application, flow rate is often zero, so flow rate is of little interest. @gohan if something is blocking the sewage's way to its final destination, pressure will build up pretty quickly. @gohan that's where you are wrong. "In many countries there are obligations to measure and report SSO occurrence using real-time telemetry to warn the public, bathers and shellfishery operators." Now that we've completely derailed this thread, could we get back on topic? If you could derive a small pipe from the main sewage line, you could could then have a transducer at the end to measure pressure without requiring it to go submerged. I can't mount a 10m vertical pipe on top of the sewage pipe, so I don't think ultrasound is a viable alternative unfortunately. https://eu.mouser.com/new/measurement-specialties/te-ms5837-30ba/ is inexpensive, small and handles 0-30bar. @gohan yes, I do need a whole solution. But I'm hoping to find something more compact. @mfalkvidd Perhaps if you expand on the objective and location it might help narrow down options. eg - Is this a pressurised pipe below the surface which may be tapped into or a deep well vented to atmosphere? Does the site have power or is this a remote location? If the intent is a submerged logger type device occasionally retrieved and downloaded at the surface, an adaption of the cavepearlproject.org format might suit. A rigid pipe with a transducer sealed and mounted on the top will work when the pipe is purged (compressor/foot pump), the static air pressure thereafter relates directly to depth of hydraulic submergence..
Have a look at freescale sensors. i.e. MXP-type sensors. You could ask for samples (they will provide up to 5 pcs. for free). Cost around $15 pcs. normally. You'd mount such a sensor on top of a riser (air-tight) and when the (sewage) water rises, the air-pocket is compressed proportionally. This is how I measure the ground-water level at my location and it helps me to keep my basement free of water. Works flawlessly! @mfalkvidd I still cannot understand why cannot you mount a water sensor in the riser tube or just above bottom? open tubes will fill / drain based on condensation temperature changes etc. Freezing is often an issue but I'll guess at you depth you don't have to worry about it. Have you considered a pressure switch? It wouldn't necessarily solve the seal problem but might work for you. Still thinking.... the pressure switch might be hard to self test. At least on the pressure you can see small changes, suggesting the transducer is functioning. If you are looking for a lower cost solution, look for "absolute" pressure sensors as opposed to "gauge" pressure sensors. If you want to go the potted route, you might look at this: [link text](absolute xducer). If the cabling was completely potted in a suitable material, this could work for you. Maybe just measure the height of the effluent? It should be proportional to the pressure. It seems like what you care about most is overflows anyway. I use a pressure sensor on the output of the pump that feeds my solar hot water panel. I think I got mine on Amazon. They use a lot of them in automotive applications. They come in lots of different pressure ranges. On mine I think I first had to figure out how to convert the analog input port reading from a number to a raw voltage. Most important you will first need to take a reading of your sensor in open air. FYI most of these sensors will run with any gas or liquid i.e. air, oil, water, etc. This is why we need the open air reading. If your current voltage reading and your open air voltage are the same that means you current pressure would be 0 zero, right? The next part the 7 is a little more complicated but remember it's just a number and I think I got mine right off the spec sheet for the sensor. If you plotted a graph for every reading from 0 psi to the sensors max pressure the slope of that line is where the number 7 comes from. Technically it's the slope of the linear regression. But we don't care how we got it because someone even nerdier than than me did the math and it's on the spec sheet. That's why we buy a new one instead of taking one off an old motor at the junkyard. With that info I first had to determine the raw sensor voltage. The Arduino returns a value of 0 - 1023 for a voltage of 0 - 5 volts (I mostly use 5V Arduino's) so to find the voltage I use the following line in my code. First get the raw sensor value. Then convert that value into a voltage. Then to get the actual pressure I had to do a little more math with the following line. On my sensor the open air reading was 109.
tankPumpPressure = ((rawSensorValue - 109) / 7); // Should be in PSI. I hope this helped I also take flow reading. Sorry to say you can't use a tube submerged in the water. That will only work for a very short time. I was going to use that method to take a pressure reading to see how much head (water depth) was in my water well. The problem as I was told is the air in the tube is eventually absorbed by the water ending with a pressure of zero. If you had a way of blowing the tube clear of water just before you took each reading that would work. @rwoerz Partly true.... There are multiple effects on a compressed air pipe in water (condensation, gas absorption, etc) which reduce effective air volume and pressure over time, but these are in reality very small. Blowing the pipe clear before every measurement is an ideal datum but is generally impractical other than in industrial locations. In reality, a periodic purge with a footpump to an inserted tyre valve on the pipe will restore pressure accuracy for many months at a time for a static well scenario. The circumstance posed by @mfalkvidd originally is quite different in that a CSO or SSO is a surcharge arising from periodic rainstorms rather than a constant submergence. If the sealed pipe is installed at a level with free discharge when flow abates, it will function very accurately as it compresses from a natural state. All that is required is to add the height of the pipe to Invert and the actual level can be derived. The bigger problem would be installing a 10m rigid airtight pipe..
gohan great solution wish I had thought of that! Not sure where I got the info that it wouldn't work. They didn't say how long it would take to get bad readings. Because the pressure transducer I used is sealed you wouldn't have the same problem. As long as the connection were made watertight the sensor could just be installed at any level and it should work without the extra pump. Assuming you don't install it with the open end pointing down trapping a tiny bit of air in the opening. Not sure that would affect the readings but why take the chance. As most of you figured out, this is not for a home DIY project. It is not my project so I can't share a lot of details. The "industrial" solutions are expensive (for example, the "submersible transducer" linked by @JohnRob costs $400+) and require big sensors. Often, DIY users have found clever solutions - and several such solutions have been suggested here which has given me a good perspective of the possibilities which I really appreciate. Thanks! If I were to look for a lower cost solution (vs a full industrial offering) I would talk to Epcos EU. I have worked with them in the past and they have a small absolute pressure sensor that may work for you. I didn't read into them much, but you may find a solution with them. Does anyone have an idea on cost efficient water pressure/level measurement in 1000 ft deep groundwater wells? There is a new law in California that made these measurements mandatory and my good friends have to drive some crazy mileage to do manual cord measurements of water level. If you want to measure level in a sewer and get a measurement that can be used for something "that have a high degree of accuracy" it needs to be atmospheric compensated, otherwise the measurement will be off by a lot, because of pressure in the pipe system, normally a sewer system is not open to the atmospheric pressure because of gases. If your application is anything like the picture, that would not be a good solution, since a atmospheric sensor would have a small air tube and getting water into those would make it unstable. if you can put your vent tube so no water gets in then a pressure level measurement would be a good solution. I normally use alibaba for that. But if you only want to know when the water level reach a certain height there is the option of using a float switch. I often find that there is a need for a combine solution, both pressure/ultrasonic and a float, to keep up a high accuracy, sewer systems are a whole other world when it come to sensor technology, but again it depends on what you need. above link is an example of a sensor which could be used. Not sure what the level change will be, but the "new law" as you refer to will tell you what accuracy is needed. This sounds to me as a perfect example of a LoRa sensor. The sensor goes in the bore hole (same as the manual cord measuremens) and stays there. The electronics (4-20 mA preferrably as 1000 ft is quite a distance) can remain at ground level. If you have any idea what the change of level is in the well, you can easily find the range for the sensor. @ybirch Hi did you see the post I posted?